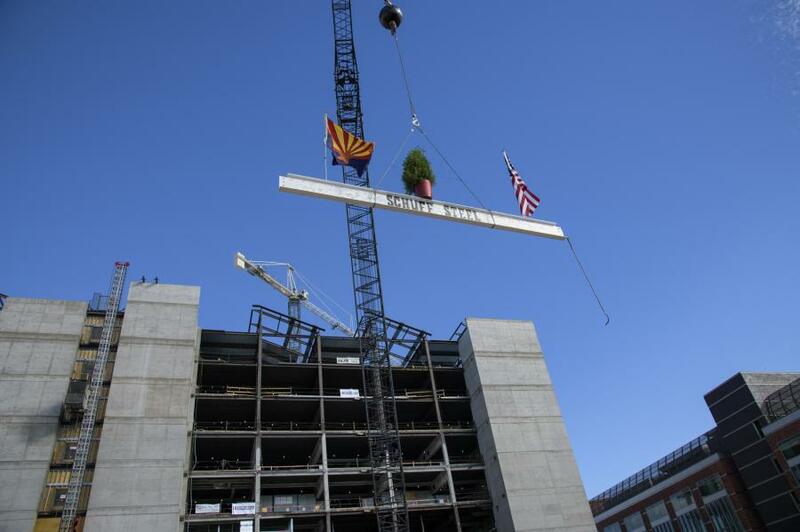 The last steel beam in the construction of the new University of Arizona Health Sciences Innovation Building has been hoisted into place. Covered with signatures and bedecked with U.S. and Arizona flags and a small ceremonial tree, the beam rose above the crowd that had gathered for the Nov. 17 “topping-off” ceremony, which was presided over by UA President Robert C. Robbins, Provost Andrew C. Comrie and Leigh A. Neumayer, interim senior vice president for health sciences. “That's the future, and I think that that's going to be the key to improving our retention rate, our graduation rate and providing our students with the tools necessary to go out and compete and work effectively in a team-oriented approach, certainly around the health sciences but around all of industry,” he said. Attendees were invited to sign the steel beam before it was placed, a milestone in the construction of the $165 million, nine-story, 220,000-sq.-ft. building at North Cherry Avenue and East Drachman Street on the UAHS campus. Construction began in June 2016. Scheduled for completion next summer, the Health Sciences Innovation Building is designed for interprofessional, team-based health professions education. The futuristic facility will include flexible group/team learning areas and an innovative medical simulation center that will serve to foster collaboration among multidisciplinary teams of health professionals, students and faculty in the UA colleges of medicine, nursing, pharmacy and public health. • “Flipped classrooms” that can accommodate as many as 150 students for interactive learning. • A “special events forum” that can accommodate more than 1,000 people. • Clinical labs and simulation centers. For more information, visit uanews.arizona.edu/photos/toppingoff-ceremony. 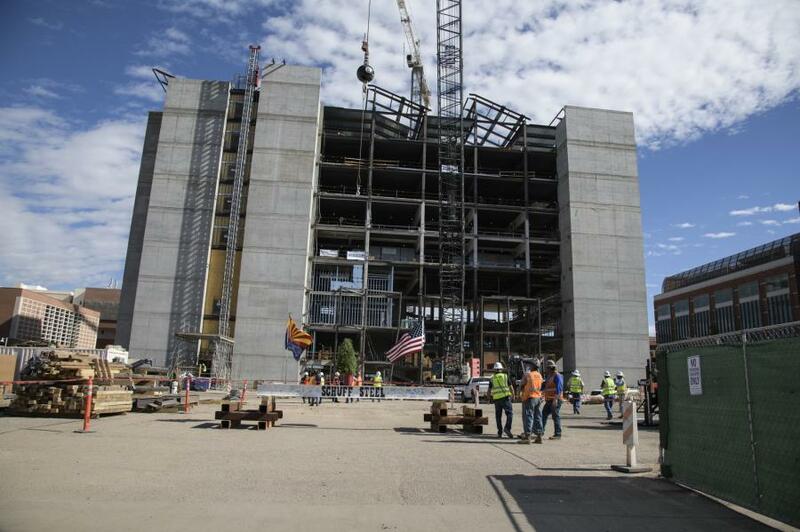 To read more about the University of Arizona Health Sciences Innovation Building, see Work Under Way on University's Health Sciences Campus.